At every stage of the aging process, we find more things that are confusing or that just don't make sense! 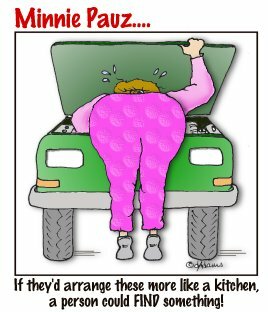 Like where to find certain things under the hood of the car or even the way they place things in the grocery store. It never seems to be in a LOGICAL place, right? During menopause and even peri-menopause, many women start noticing that they have forgotten where they place things or just can't figure out everyday problems like they used to. It's all related to the hormonal changes going on! The "change", as they used to call it, affects nearly every part of your life...mentally, physically and emotionally, but it's not all bad and won't last forever. The best way to handle YOUR change is to educate yourself and communicate any problems with your doctor. In other words, take charge of your health and trust your instincts!